The writing of this essay, which was originally published on Modes of Criticism 3 under the title “LinkedIn Society”, was concluded just before a quite drastic redesign of LinkedIn’s interface. In its conclusions I somehow predicted the elimination of the anomalous functionalities that made LinkedIn peculiar in comparison to the standards of other generalist social media platforms like Facebook. As I argued, these now obsolete functionalities illustrate a utilitarian transparency more genuinely adherent to the ideology and the aims driving the design of the platform than the full “rhetorical turn toward conviviality” (Davies 2016) that characterize other dominant social media and guided the current redesign of LinkedIn. Instead of updating the essay according to the new design, I decided to preserve my original analysis in order to provide a chronicle of the recent history of social media and a proof of the difficulty to formulate a timely critique in a medial ecosystem that is in “permanent beta”, just like contemporary workers must be according to LinkedIn cofounder Reid Hoffman (2013). In the last years, much has been written on the Facebook Like Economy, on the grassroots genealogy of the Twitter hashtag, on the formation of a narcissistic subjectivity on Instagram. During this period, LinkedIn has been almost completely ignored. In the Social Media Reader, published in 2012, it is not even mentioned once. In the Unlike Us Reader, published the year after and focused on possible alternatives, LinkedIn appears five times, but only as a fleeting example. Unlike generalist social media, LinkedIn has a specific focus, the world of professionals. IHowever, it is a platform where it’s possible to identify , both in its interface, its communication and its origins, some latent dynamicsthat presently orient social media and, therefore, society at large. This is what makes it unique and therefore valuable in the current social media landscape. In this essay, I discuss LinkedIn’s unique functionalities, rhetorics and principles. What is the usefulness of LinkedIn, an online professional network mostly known for its spammy email techniques? In the creative industries, while most people have an account, no one seems to actually use it. As a communication tool, it is mainly experienced in a passive way. Furthermore, none of my peers seem to believe in LinkedIn as a way to land a job. However, when one is faced with unemployment, a glossy portfolio may not be enough anymore. I experienced it myself: as soon as I started to feel anxious about my job situation, I religiously followed LinkedIn’s automatic suggestions to improve my profile. Creative workers approach LinkedIn with the same skepticism that they have towards the bureaucratic strictness of the Europass curriculum vitae format, yet the platform provides a feeble hope in times of job search despair. Cartoon modified by Frank Chimero. Does the abundance of doubts on its actual usefulnessmake LinkedIn irrelevant ? Is the daily use of an online platform the only indicator of its cultural significance? Regardless of its supposed inertia, LinkedIn subtly reminds us of the pervasive regime of both online and away-from-keyboard professional networking. 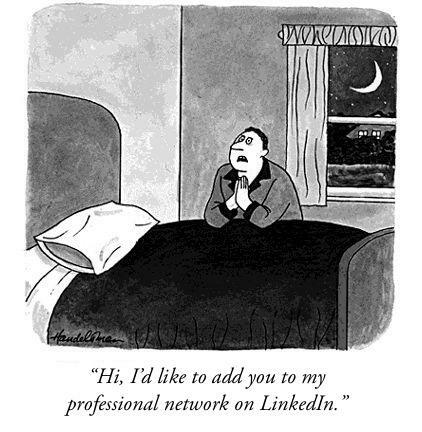 In a series of modified vignettes, graphic designer Frank Chimero showed that the standard Linkedin invitation —”Hi, I’d like to add you to my professional network on LinkedIn”— might function as a universal caption for The New Yorker‘s cartoon. In Chimero’s appropriations, we see people pronouncing that phrase in any kind of social situation, like for instance in bed. These revised cartoons are poignant because we instinctively recognize the way in which professional networking permeates our lives. In this perspective, the very existence of LinkedIn appears paradoxical, since it assures us that work and life are distinct spheres. According to its CEO Jeff Weiner (2016), 80% of LinkedIn users want to keep their personal and professional lives separate. 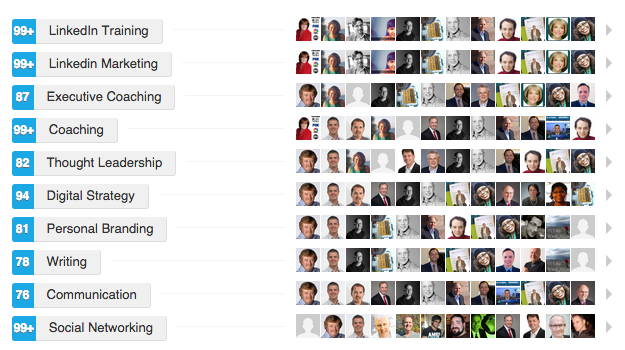 LinkedIn is thus more than a series of networked résumés. It functions both as a symbol and a platform that displays, enacts, and somehow exacerbates the social dynamics of work ethic. Preceding Facebook by one year, LinkedIn was founded in 2003 by Reid Hoffman together with some colleagues from Social Net and PayPal. During the last thirteen years, 450 million users signed up for LinkedIn, a third of Facebook’s user base. As the technology writer Evelyn Rusli (2013) points out, LinkedIn was seen as “the ugly duckling of social media” by investors, because of its hybrid business model, and “your mom’s or your dad’s network” by users, probably because of its corporate allure. However, things have changed in the last years. Not only more young professionals joined LinkedIn, but, according to Jeff Weiner (2014), users now tend to keep their profile constantly updated, rather than adding new experiences only when looking for a job. One could say that this shift, instead of representing a deeper commitment to the platform, merely reflects the extreme flexibility and the demand for relentless improvement that these young professionals have to face. LinkedIn’s mission to “connect the world’s professionals to make them more productive and successful”, is accompanied by an ambitious vision for the future that is epitomized by the company’s Economic Graph. The idea is simple: LinkedIn wants to create and manage the profile of each of the estimated three billions members of the global workforce, together with the profiles of every existing company, every available job, every required skill, and every institution that can provide these skills. Presented as a response to the steady rise of unemployment, the Economic Graph renders any kind of relationship as an economic exchange between economic agents. It visually embodies the neoliberal paradigm. From graduation, to a corporation, some adulation, and eventually some serious relaxation. The book begins with a quote by Bangladeshi social entrepreneur and Nobel Peace Prize Muhammad Yunus, according to whom “all human beings are entrepreneurs. When we were in the caves, we were all self-employed”. Entrepreneurialism is therefore naturalized as a form of primordial urge. It becomes an ‘instinct’ that emerges from the frustration of leaving an opportunity economically unexploited. Not only is entrepreneurship coded in the human DNA, but it is also a universal common: after traveling from rural Indonesia to Colombia, the authors can serenely conclude that “entrepreneurship is a life idea, not a strictly business one; a global idea, not a strictly American one.” However, in the book there is no trace of the deductive character of these findings: the model that the authors have in mind casts the reality that they experience. As if it were a giant Monopoly game, the world is there to be read in terms of investments, risks, and opportunities. The emphasis on personal responsibility and entrepreneurial spirit is then complemented by the glorification of entrepreneurs in the strict sense: freewheeling individuals who “deal with uncertainties and changes”, “take stock of their assets, aspirations, and the market realities” and “aggressively seek and create breakout opportunities”. LinkedIn represents the ideal platform to test the exercises proposed by Peters and Hoffman to become respectively a brand and a startup. Its user experience is based on the demand of constantly improving one’s profile, which ideally should be a melange of personal values and professional achievements. Is your profile up-to-date? What does it say about the causes you care about? Have you ever volunteered for an organization? Who are the public figures you’re influenced by? Did you ever win an award? As stated in a promotional video, “it’s a CV that never sleeps”, that shares any update with your network by default and that will eventually reward you with an All-Star badge. An example of “endorsement tapestry”. Tutorials for profile improvement proliferate, some of them produced by LinkedIn itself , populating a market of professional self-help including titles like From Linked Out to LinkedIn: Unlocking the Power for Career Success. One of the primary tactics of an effective LinkedIn strategy concerns the profile picture: “your face should occupy at least 60% of the frame”, “be serious but not gloomy”, and other tips like these abound. In a tutorial meant for recruiters, one of the suggestions is to “exude approachability”. The quantified, saccharine future portrayed in Black Mirror’s “Nosedive” episode doesn’t seem that distant. Is there anything new about this? Everybody knows that it’s important to dress properly for a job interview. But the job interview is now permanent, and a professional demeanor is permanently required. Like an elevator pitch in a skyscraper with infinite floors. According to Peters, career is now “a checkerboard. Or even a maze.” However, LinkedIn artificially reconstructs the verticality of a ladder through a unique ranking system based on profile views. Literal even in terms of interface design, the competitive dimension of career building is represented as a vertical list. With a free account, users have access to their top ten most-viewed connections and the ones just next to them, in the context of their whole network, their own company, or among professionals in the same field. This ranking system has a twofold function: it is framed as a valuable information sold to premium users while it exhorts the others to put effort in the curation of their profiles. This is a unique feature among social media: on Facebook or Twitter one can only deduct the popularity of other users from the quantity of Likes, Shares, and Retweets. Another unique feature of LinkedIn allows users to know who looks at their profile. And, as shown by David Veldt (2013), this form of voyeurism is predominantly oriented towards “young, attractive women”. Here, we catch a glimpse of the indirect usefulness of LinkedIn: the fact that we can’t perceive the same phenomenon on generalist social media doesn’t mean that it is not taking place, so LinkedIn’s utilitarian transparency helps us to formulate general questions on social media usage. As Geoff Shullenberger (2016) points out, one of the reasons why Peter Thiel, the controversial PayPal founder, originally financed Facebook is because it is informed by a theory of which Thiel is particularly fond: René Girard’s mimetic theory of human social life. Put simply, Girard claimed that humans desire things because other humans desire them. Desire becomes therefore triangular: it involves an object of desire, a subject who desires the object, and another subject who imitates the first one. It’s easy to see how Facebook, through Likes and Reactions, materializes signals of desire and it is in turn able to shape desire itself. Together with the “I’d like to add you…” one, there’s another type of email that I constantly receive from LinkedIn. The formula is the following: “Congratulate X on the new job”. Each time that my peers update their position, I’m notified about that and therefore urged to respond. I’m presented with a desirable achievement that I should congratulate for, and so I’m asked to materialize my signal of desire. These requests don’t take into account the current professional status of the receiver, so it is worth asking what are the effects of such kind of spam when someone is having trouble landing a job and other people’s success is one click away. Is LinkedIn so different from Facebook? Social media are generally understood as platforms that enable, facilitate, or amplify personal expression and communication among peers. But besides this fundamental function, social media also foster the relentless curation of a personal brand and the performance of an entrepreneurial persona whose effectiveness is constantly measured and ranked. Nowadays, analyzing the Facebook profile of candidates before hiring them is a matter of common sense. Furthermore, Facebook portrays users as “enterprise-units” since the layout of a personal account has the same appearance of the one of a company or a brand. It wasn’t like this some years ago, when the Facebook profile of a user resembled a standard CV while the one of a brand, with its cover image, looked like an advertising space . Companies don’t have their own résumé, so maybe it’s the CV itself that is becoming an insufficient tool to promote one’s self-startup. Linkedin is paradigmatic of the apparatus surrounding what can be called as entreprecariat. That is, entrepreneurialism driven by precarious professional, financial, and emotional conditions. It incorporates the entrepreneurial attitude and the anxieties flitting over it, in both its interface design,in its communication strategy and its ideology. Originating in society at large, the entreprecarious condition permeates every social media, but we tend to overlook it in favor of such notions as community, sharing, and connectivity. Ultimately, we fail to acknowledge the individual dimension of social media, the pressure that the social interactions mediated by these platforms put on the subject, as a single, and paradoxically isolated, human being. LinkedIn was recently acquired by Microsoft for $26.2 billions in cash, one of the biggest deals in tech history. It comes as no surprise that Microsoft promised to preserve LinkedIn’s brand, culture and independence, but nobody exactly knows what will happen. LinkedIn could soon morph into something completely different or even slowly disappear. That would be a pity. When Facebook informally asks “What’s on your mind?”, it doesn’t only allow users to share feelings and thoughts, it also captures data that can be rationally analyzed in a way that can’t be easily inferred from the original question. Sociologist William Davies (2016) compares this ambiguous surveying process to the method employed to study a focus group. A one-way mirror is used to observe the subjects, who are placed in a comfortable environment that fosters conviviality. While the subjects socialize, useful information is seamlessly collected. This method is particularly successful when the subjects don’t realize that the data collection is taking place. An informal setting is helpful to achieve this goal. Thus, informality contributes to produce opacity whether the context is physical or digital. According to Davies, “social media’s new forms of emotional language can save the user from having to find a more objective or dispassionate perspective”. This is why LinkedIn’s outspokenness is valuable: it explicitly shows some dynamics that appear on other social platforms in a sweetened manner , yet they are carried out in a rationally brutal way. 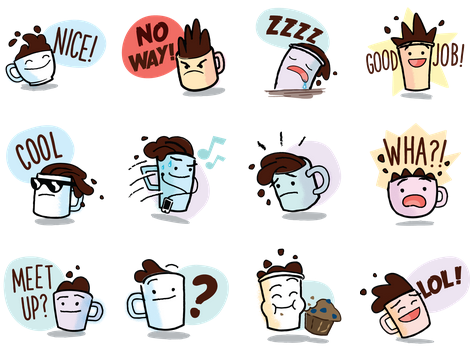 Without LinkedIn, we would be left with puerile illustrations and cute emojis that are increasingly populating Facebook while hiding the hard numbers and the rationale behind them. However, while some hard numbers are still visible on LinkedIn, its “rhetorical turn toward conviviality” is already taking place. Political theorists Nick Srnicek and Alex Williams (2015) argue that “with work tied so tightly into our identities, overcoming the work ethic will require us overcoming ourselves”. Similarly, competitive entrepreneurialism is so embedded into the current social conduct that it became invisible. In order to become recognizable, it needs to be externalized, estranged. LinkedIn does exactly that: incarnating the collective obsession with work, competition, and success, it makes users a bit more aware of the way they perform accordingly. When the ranking system is so visible, they might start to question whether it is actually significant. This plausible form of distrust, already involving LinkedIn’s spammy messages, makes it a goofy mascot to make fun of for things that we are dead serious about. Berardi, F. (2009) The Soul at Work: From Alienation to Autonomy. Semiotext(e) Foreign Agents Series. Los Angeles, CA: Semiotext(e). Davies, W. (2016) The Mismanaged Heart. In: Real Life Magazine, August 3. Available at: http://reallifemag.com/the-mismanaged-heart/. Foucault, M. (2008) The Birth of Biopolitics: Lectures at the Collège De France, 1978-79. Basingstoke [England]; New York: Palgrave Macmillan. Hoffman, R. & Casnocha, B. (2012) The Start-up of You. New York: Crown Business. Veldt, D. (2013) LinkedIn: The Creepiest Social Network. In: Interactually. May 9. Available at: http://www.interactually.com/linkedin-creepiest-social-network/. Peters, T. (1997) The Brand Called You. Fast Company, August 31. Available at: https://www.fastcompany.com/28905/brand-called-you. Rusli, Evelyn M. (2013) LinkedIn: The Ugly Duckling of Social Media. In: Wall Street Journal, February 28, sec. Business. Available at: http://www.wsj.com/articles/SB10001424127887324432004578304740861400194. Shullenberger, G. (2016) Mimesis and Violence Part 1: Peter Thiel’s French Connection. In: Cyborgology. August 2. Available at: https://thesocietypages.org/cyborgology/2016/08/02/mimesis-and-violence-part-1-peter-thiels-french-connection/. Srnicek, N. & Williams, A. (2015) Inventing the Future: Postcapitalism and a World Without Work. London: Verso Books. Weiner, J. (2014) LinkedIn’s Vision for the Next 10 Years. March 13. https://www.youtube.com/watch?v=jm15S1QmOTw. Number of LinkedIn Users (2016). Statista. Accessed November 3. Available at: https://www.statista.com/statistics/274050/quarterly-numbers-of-linkedin-members/. See: Yu, A. (2016) Introducing the LinkedIn Students App: Helping Soon-to-Be College Graduates Conquer Their Job Search. In: LinkedIn Blog. April 18. Available at: https://blog.linkedin.com/2016/04/18/introducing-the-linkedin-students-app–helping-soon-to-be-colleg. See: Lorusso, S. (2016) What is the entreprecariat? In: Institute of Network Cultures, November 27. Available at: http://networkcultures.org/entreprecariat/what-is-the-entreprecariat/.